In Macau we saw Ferrari and Lamborghini cars every single day, along with other high-end, rare, expensive vehicles. Of course, living right next to an exotic vehicle dealership ensured that we never went long between sightings. Since we arrived in Shanghai, we've been playing a game called Three Things. Everyone has to point out three things they've seen that stood out. One of my three things wasn't something that I actually saw, it was the absence of something I was used to seeing: high-end vehicles. Volkswagen cars are plentiful (more about that later), but I haven't seen anything with a horse on the back. Until today. Parked on the sidewalk no less! I had to stop and take a photo of the Ferrari that blocked our path, and then of course I had to write about it because I just read the reason for the lack of Lamborghini's populating the roads here. The taxes in China for imported luxury vehicles runs between 145 and 300%! Ouch! Which means the guy (or gal) who parked this beauty on the sidewalk was just protecting their investment, right? Though we've seen plenty of cars with lesser price tags parked similarly, so I think it's just a China thing. Either way, she sure is pretty! 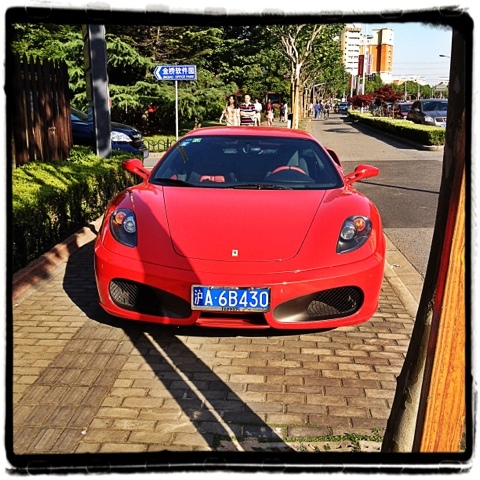 I'm up in Beijing and seeing a Ferrari is an everyday occurrence in my neighborhood. In fact, I also see Maserati, Bentley, Porsche, etc. everyday. I always thought that Shanghai would be the same. In spite of the high taxes, the rich up here in Beijing are definitely buying!